In a large mixing bowl combine flour, sugar and salt. Blend in shortening and butter with a pastry blender or hands until pieces resemble small peas. Sprinkle 1 tablespoon of ice water over the flour mixture and toss. Repeat, using 1 tablespoon of water at a time, until it is moistened and knead until it comes together. Divide into 2 uneven balls; one ball should contain two-thirds of the pastry. Cover and set aside. In a separate large mixing bowl, combine thawed fruit, sugar, oats and lemon zest. Set aside. On a lightly floured sheet of parchment paper take the larger dough and roll it out into about 1/8-inch thick. Using a fork, prick the dough a few times then transfer to your desired baking pan. (I used an 8 inch baking dish. If you used a small baking dish you will have enough dough leftover to make cookies. The measurements for this recipe can fit up to a 15x10 pan) Peel off wax paper and press the pastry up the sides of the pan. Spoon strawberry filling over the pastry. 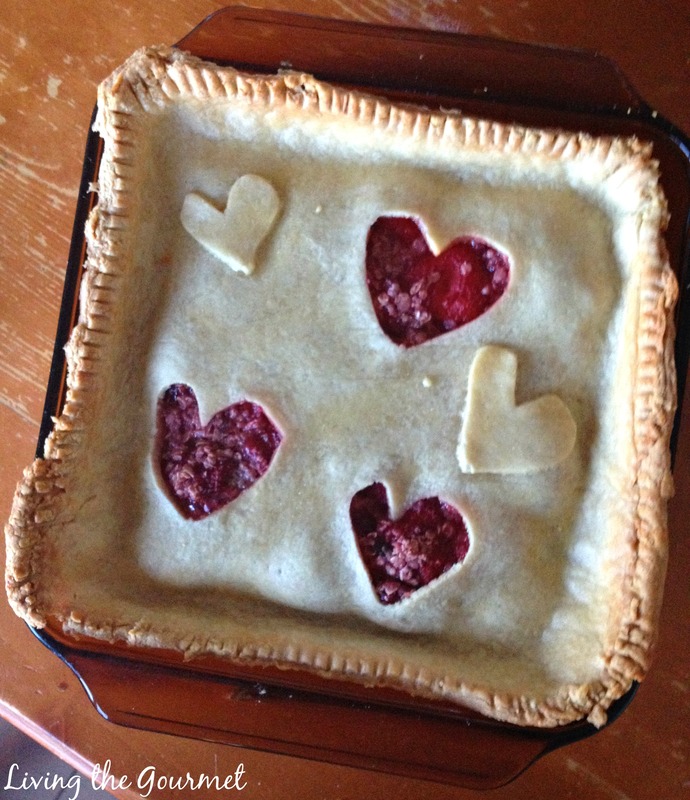 Repeat the process for the second dough and cut hearts out of pastry and set aside. Invert pastry over fill. 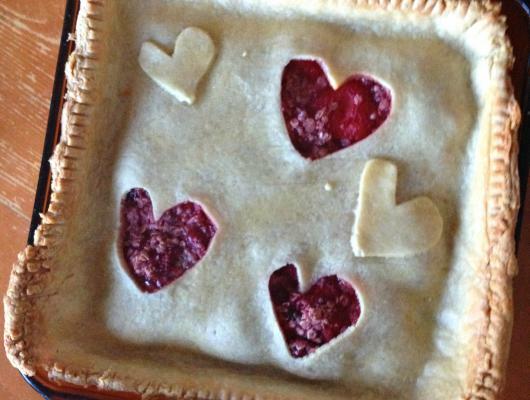 Peel off wax paper and arrange cutouts on top of pastry. Seal the edges of the pastry together with a fork, or crimp with your fingers. In a small bowl whisk together 1 egg white and 1 tablespoon of water. Brush over pastry. Bake for about 40 minutes or until golden brown. Cool completely in pan on a wire rack.